I wonder what the people in the theater who hadn't already read Gone Girl thought of the movie. I loved the book as an enjoyable page-turner, and I enjoyed the movie as well. But it followed the book almost exactly, so all the Hitchcockian suspense was a little ruined by my prior knowledge of what was coming next. Leaving that behind, Ben Affleck and Rosamund Pike turn in really good performances as a fairly unlikeable man and his disappeared wife. Especially Pike, whose deep-throated blonde-bombshell performance clearly echoes and pays homage to the great Alfred Hitchcock leading ladies Grace Kelly, Kim Novak, Eva Marie Saint, Janet Leigh, and Tippi Hedren. David Fincher certainly doesn't hurt his already impressive resume of film direction, which includes Seven, Fight Club, The Curious Case of Benjamin Button, The Social Network, and The Girl With the Dragon Tattoo. 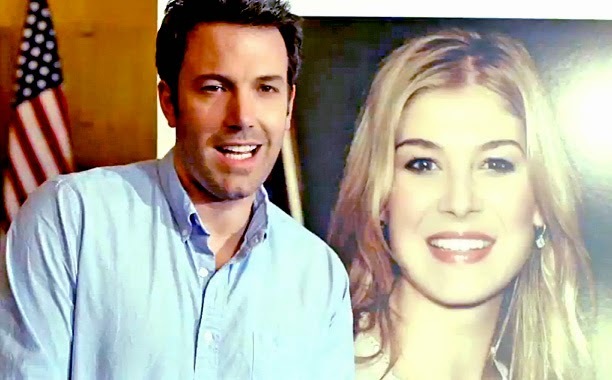 That said, Gone Girl was such a great book that it was a bit of a softball of an easy home run to turn into a movie.